Can't decide what drink to order next time you’re at the Paradise Cove Beach Cafe? 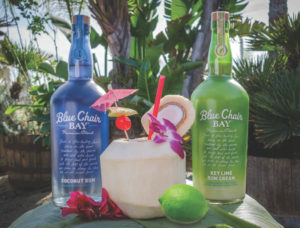 We have teamed up with Kenny Chesney, and added our own flair to his very own premium Blue Chair Bay Rums. Not only do they taste amazing, but they inspire total immersion into the relaxing beach lifestyle that his music promotes. Choose from a variety of cocktails created right here at the Paradise Cove Beach Cafe, and be sure to try the tropical Blue Paradise and see why it's become an instant favorite. Kenny Chesney, the world famous country star, often sings about relaxing on the beach.The Paradise Cove Beach Cafe is the perfect spot to sip on a cocktail, relax, kick back and watch the ocean. 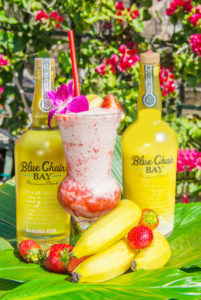 Here at the Paradise Cove Beach Cafe we have created several amazing cocktails featuring some of his Blue Chair Bay Rums. They are all delicious, but of all the concoctions, the Blue Paradise has gained the most popularity. Kenny Chesney launched this brand in 2013, calling it his inspiration and his story. He makes sure everything has his stamp of approval. Deciding to ensure the quality of the product rather than just endorsing any spirits company means he isn’t just in it for the money. This, next to music, is his passion. Wanting complete ownership of this project, he makes all the product decisions. This really personalizes the brand, which has worked in his favor. According to Forbes.com, Blue Chair Bay’s annual sales have almost tripled since its beginning in 2013. In Kenny Chesney’s song, “Old Blue Chair,” he sings about his love for islands and a fictional place called Blue Chair Bay. Some of the lyrics to this song are found on the label of the rum bottles. All of Blue Chair Bay Rum is 100% gluten free and made in the Caribbean. 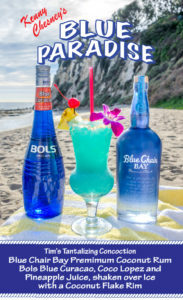 Also known as “Kenny Chesney’s famous blue cocktail,” the Blue Paradise is crafted from Blue Chair Bay Premium coconut rum, Bols blue curacao, Coco Lopez and pineapple juice, shaken over ice with a coconut flake rim. Not only does this drink taste amazing, it looks amazing! We at Paradise Cove are known for our beautiful drinks - ready to snap an idyllic photo with the Pacific Ocean as a backdrop. Kenny Chesney is a pro when it comes to relaxing on the beach and drinking rum. We would definitely recommend his Blue Chair Bay tropical cocktails when deciding what to order at the Paradise Cove Beach Cafe!